So it's that time again: a new set is coming out Friday. This is the long anticipated From the Vault: Twenty. So without further ado, let's take a look at these cards and get some opinions as well as some background on the cards. 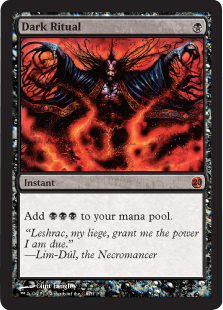 Dark Ritual is an iconic card because for one black mana, you wind up with three black mana. Essentially you are just adding two mana to what you started with. The primary formats it is legal in are Vintage, Legacy, and Commander.Dark Ritual has always been printed as a common. Dark Ritual was last printed in Duel Decks: Phyrexia vs. The Coalition and Planechase (2009). The art for the FTV version comes from Planechase. wateradept24's Review: Dark Ritual is awesome ramp for any black deck, but while it is legal in several formats, I would only utilize this in black EDH/Commander deck since I don't play the other formats it is legal in. 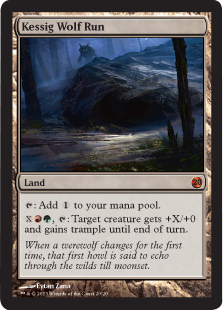 Honestly, I would have loved Sinkhole in this spot since it is off the restricted list and was last printed in Unlimited. THEALLMIGHTYGOAT's Review: I'm glad to see it printed in FTV:20 because it deserves to be in it. Being one of the staple black mana cards and always printed as a common gives it a special place in many MTG players Vintage, Legacy, and Commander decks all around the world and I'm very glad that they are now given a foil (never has been in foil) edition of this card for there decks. 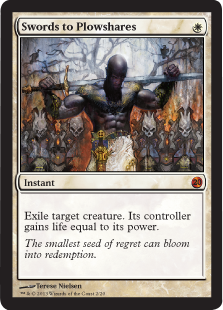 Swords to Plowshares is a simple spell used to exile a creature at instant speed. Like with Dark Ritual, the main formats it is legal in are Vintage, Legacy, and Commander. 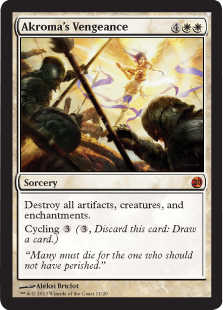 Swords to Plowshares has always been printed as an uncommon. The art for the FTV version comes from Duel Decks: Elspeth vs. Tezzeret. wateradept24's Review: Swords to Plowshares is a very simple removal for a creature, but could also be used for life gain on a creature of your own. Like with Dark Ritual, I can only see myself using this in Commander. 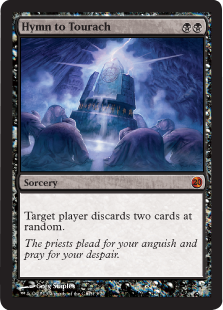 Hymn to Tourach is a two mana spell that causes a chosen player to discard two cards. Like the previous cards, this is legal primarily in Vintage, Legacy, and Commander. Originally printed as a common in Fallen Empires, it has never been reprinted in a physical manner, but was printed in MTG Online. In Fallen Empires, there were four different artworks for this card. wateradept24's Review: Once again, only a Commander card for me, Hymn to Tourach is an easy way to get your opponent to ditch cards from their hand and also give you a card advantage by forcing your opponent to have two less in hand by turn two. THEALLMIGHTYGOAT's Review: Being another black staple card and one of the most used back in its release year of 1995 I am very glad to see it appear here and i am very excited to get my hands on one of these. 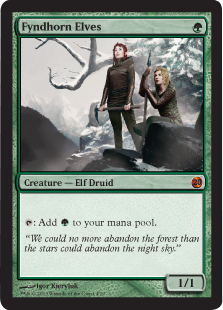 Fyndhorn Elves is a simple card that many sets have some vesion of: a card that for one green mana, taps for a specific color (in this case green). Like the previous cards, this is legal primarily in Vintage, Legacy, and Commander. Fyndhorn Elves has only been printed in Ice Age, except for one set on MTG Online. Fyndhorn Elves was printed as a common. The art is completely new for this card. wateradept24's Review: Fyndhorn Elves is essentially a Llanowar Elves, but is another card to put into a mono-green elf deck to ramp. This seems perfect for a green Elf Commander deck I've considered making at some point. This way I could have two mana elves. THEALLMIGHTYGOAT's Review: Being that there is Llanowar Elves a lot of people didn't know this card even existed also it doesn't help that it has only had one print under it's belt. Seeing play in many people's cube's it is nice to see a foil alt. art print of this card. Impulse is a typical card for searching for specific cards, by looking at the top cards of your library and choosing one while putting the rest somewhere else in your library. Like the previous cards, this is legal primarily in Vintage, Legacy, and Commander. Impulse is found as a common in Visions, but was also reprinted in the Beatdown Box Set. This is completely new art for the set and was the art that went along with the announcement of this set. wateradept24's Review: Impulse is a very useful way to help find a specific card and takes the other cards out of your way without dumping them into your graveyard. THEALLMIGHTYGOAT's Review: Being a staple card in many blue decks back in its day deserves Impulse it's spot in FTV:20. It even sees play in Cube and Commander still to this day. Wall of Blossoms is a typical wall creature, but also lets you draw a card when it enters the battlefield. Overall, not a bad card at all, especially since it is a 0/4 wall. Like the previous cards, this is legal primarily in Vintage, Legacy, and Commander. 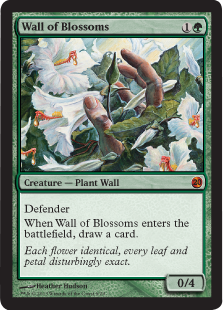 Wall of Blossoms first showed up in Stronghold as an uncommon and was recently reprinted in Planechase 2012. The art is the same on all three versions of the card. wateradept24's Review: Wall of Blossoms is a great card for blocking and also for drawing a card. This card is essentially a much better Elvish Visionary. THEALLMIGHTYGOAT's Review: This card is loved by many people all around the world for being a draw spell with a body attached for just two mana. It slows down aggro and get's you a card. What more could you ask for. Thran Dynamo is a mana rock that costs four mana, but taps for three colorless mana. Like the previous cards, this is legal primarily in Vintage, Legacy, and Commander. 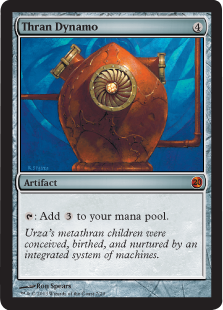 Originally printed as an uncommon in Urza's Destiny, it was reprinted in Archenmy. The art is the same on all three cards. wateradept24's Review: Thran Dynamo is perfect for a colorless EDH deck I'm planning with Karn, Silver Golem. This is a great way to ramp for much larger cards. THEALLMIGHTYGOAT's Review: Being one of the staples of the Urza block. It sets of crazy combo's with all of the artifact cards we have printed to day sure to make any Cube or Commander match fun to play. Tangle Wire is used to tap down each player's permanents and is used to control an opponent's side. Like the previous cards, this is legal primarily in Vintage, Legacy, and Commander. Originally printed as a rare in Nemesis, this is the first time it has been reprinted. This is completely new art for the set. wateradept24's Review: Tangle Wire is a great card to shut down your opponent's side of the board, but with the negative effect of locking down your board. This would typically be used in the late game, or specifically when you have more on the field than your opponent. Fact or Fiction is a way to choose some of the cards from the top of your library to keep while adding cards to your graveyard. Like the previous cards, this is legal primarily in Vintage, Legacy, and Commander. Originally printed as an uncommon in Invasion, it was reprinted in Duel Decks: Jace vs. Chandra and in Commander. This is completely new art for the set. wateradept24's Review: Fact or Fiction is similar to Jace, Architect of Thought's second ability, except with more cards. This is a great card for adding more cards to your hand for card advantage and getting the cards you need into your hand. THEALLMIGHTYGOAT's Review: Being a staple of the Invasion block i am happy to see it foiled and printed in FTV:20, I would have like to have the Jace vs Chandra art instead. Chainer's Edict is a cheap way to force an opponent to sacrifice a creature, along with the added Flashback option for use later in the game. Like the previous cards, this is legal primarily in Vintage, Legacy, and Commander. 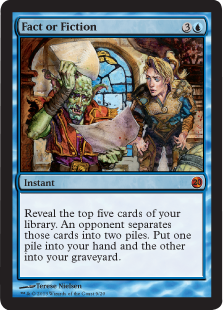 Originally printed as an uncommon in Torment, this is the first time it has been reprinted. This is completely new art for the set. wateradept24's Review: This is a simple card meant to have your opponent sacrifice a creature. It is also great that it has flashback for the late game so that an opponent sacrifices one of their larger creatures. THEALLMIGHTYGOAT's Review: Being a staple in mono black control decks back in it's day deserves it the spot in FTV:20 not to mention seeing a whopping 20 copies in the block pro tour Osaka's top 8. I am happy to see it now in a different art and foiled for all those who really love this card. Akroma's Vengeance is just like any other board-whiping white card, except you can pay half the cost to discard it and then draw a new card. Like the previous cards, this is legal primarily in Vintage, Legacy, and Commander. Originally printed as a rare in Onslaught, and was reprinted in Planechase (2009) and in Commander. This is completely new art for the set. wateradept24's Review: This is a great board wipe that tacks on Cycling allowing you to switch it for another card. THEALLMIGHTYGOAT's Review: Seeming since white has always had board wipes in there arsenal since the beginning of MTG they had to at least put one white board wipe card in FTV:20 and this one definitely fits. 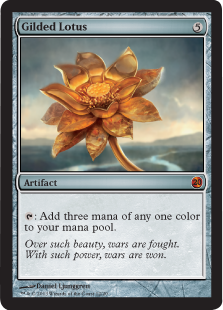 Gilded Lotus is a mana rock like Thran Dynamo, except it costs one more mana but instead of producing colorless mana, it produces any color you want. While, like the previous cards, Gilded Lotus is legal primarily in Vintage, Legacy, and Commander, it is also legal in Modern and currently in Standard until October 2013. Originally printed as a rare in Mirrodin, it was recently reprinted in Magic 2013. This is completely new art for the set. wateradept24's Review: Gilded Lotus is a great card for fixing mana and is strictly better than Thran Dynamo given that while it is one more mana, it creates three mana of a single color. Ink-Eyes, Servant of Oni allows you to return a creature from your graveyard to the battlefield, but also has the ability to be dropped in to play for a mana less from the original cost when you return an attacking creature to your hand. It is legal primarily in Vintage, Legacy, Modern, and Commander. It was originally printed in Betrayers of Kamigawa as a rare, it was recently reprinted in Planechase 2012. The art is the same for all printed versions. 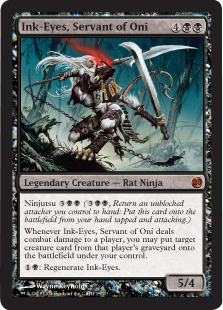 wateradept24's Review: Awesome in the Night of the Ninja Planechase deck, Ink-Eyes is a perfect commander/general for a pure Rat EDH deck. 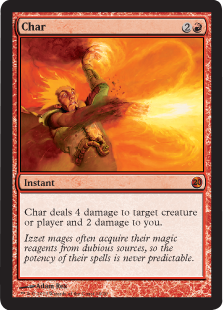 Char is a burn card that deals four damage to an opponent but also deals two damage to yourself. It is legal primarily in Vintage, Legacy, Modern, and Commander. It was originally printed in Ravnica: City of Guilds. The art is the same as the original. wateradept24's Review: I personally fail to see the point of Char. Sure it deals four damage to your opponent and two to you. I believe that there is a way to redirect damage, but otherwise four mana to shock you and deal four damage to an opponent is slightly unimportant. 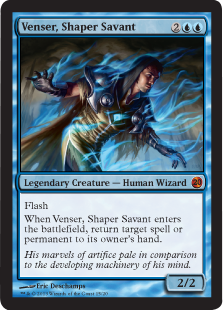 Venser, Shaper Savant is a legendary creature that allows you to bounce a spell back to an opponent's hand, or bounce a creature. It is legal primarily in Vintage, Legacy, Modern, and Commander. It was originally printed as a rare in Future Sight. This is the first time it has been reprinted and it is being reprinted with new art. wateradept24's Review: This is a great card to counter a spell or unsummon a creature, and also drop in a 2/2 creature at any time. This is an amazing card to have in this box for Modern. THEALLMIGHTYGOAT's Review: Venser is an amazing card and will always have a special in many peoples deck's including me. 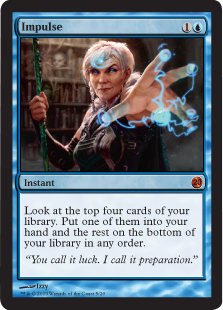 I am very happy to see it here in FTV:20 and can't wait to get my hand's on a copy of this card. Chameleon Colossus is a changeling with protection from black and also has the ability to pump it for attacking or to defend against burn. It is legal primarily in Vintage, Legacy, Modern, and Commander. It was originally printed in Morningtide as a rare, and was reprinted in Archenemy. The art is the same for all versions. wateradept24's Review: To have a card with protection from black, is all creature types, and also can double its power an toughness (unless you increase just the power of this creature). This is definitely an incredible card to have in this box. 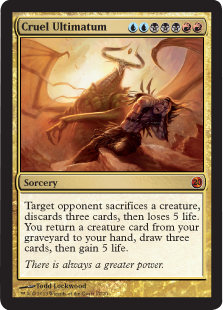 Cruel Ultimatum is a very expensive card to play, but does so much to benefit you, by gaining five life, drawing three cards, and returning a creature from your graveyard to your hand, while at the same time making an opponent sacrifice a creature, lose five life, and discard three cards. It was printed in Shards of Alara as a rare and was reprinted in Duel Decks: Ajani vs. Nicol Bolas. It is legal primarily in Vintage, Legacy, Modern, and Commander. This reprint has new art. wateradept24's Review: Cruel Ultimatum is an overly expensive card to play, is most likely unplayable in Modern, and will probably find itself mostly in Commander decks, but it definitely has amazing abilities. I personally feel that Elspeth, Knight-Errant would fit better in this spot, but then again, she was just printed in Modern Masters. 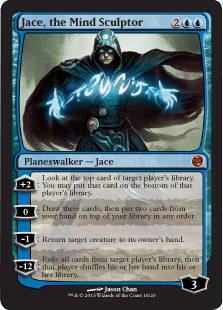 Jace, the Mindsculptor is the most iconic planeswalker in the history of Magic. It was originally printed in Worldwake and has never been reprinted until now. The art is the same as the original printing. This card is primarily legal in Vintage, Legacy, and Commander. wateradept24's Review: Jace, the Mindsculptor, as the most iconic planeswalker in the game, is sought after everyone and was banned in Standard when it was Standard legal because every deck used him. You can use it to take some awesome card off the top of an opponent's library and put it on the bottom, draw the cards and put two of them back, or unsummon a creature the first time he is out on the battlefield. If you can make the ultimate ability, you effectively bring the game to its end in a few turns. This definitely was an awesome choice for the box. THEALLMIGHTYGOAT's Review: Well we don't really need to talk about him we know why he is in FTV:20 and I'm glad to see it printed in this set. 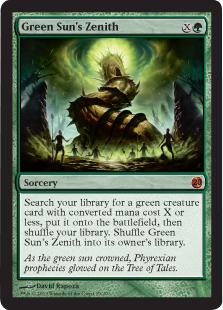 Green Sun's Zenith is an easy way to find a green creature in your library. It was originally printed in Mirrodin Beseiged as a rare. It is legal primarily in Vintage, Legacy, and Commander. The art is the same as the original printing. wateradept24's Review: This is a great card to tutor to a specific creature over and over again. Definitely an awesome card to use. THEALLMIGHTYGOAT's Review: This card is so much fun in format's such as Commander all the way to Legacy. It not only let's you search for things like Scryb Ranger, Dryad Arbor or Gaddock Teeg, but will most likely let you drop Primeval Titan as early as turn 6 or even turn 5 and the best part about this card is that it recycles itself so it can be used over and over again. This card is one of my favorite's of the list so far. Kessig Wolf Run is a land great for pumping creatures and giving them trample. It was originally printed as a rare in Innistrad, and has the same art as the original printing. It is primarily legal in Vintage, Legacy, Modern, and Standard until October 2013.
wateradept24's Review: I think this is an amazing card for pumping creatures and adding trample to the mix. You can use any amount of mana under your control plus a red and green to let loose a powerful creature (and if Naya, preferably a creature with lifelink). Definitely an awesome card to print. I was honestly expecting something like Geist of Saint Traft or Snapcaster Mage, but this definitely is a great last card for the box. THEALLMIGHTYGOAT's Review: Well this card has blow out written all over it. Making debut's in decks like Jund, Gruul, and even Naya it is an amazing card. It allows you to swing the game in your favor very quickly by just over powering your opponent. I also heard that Kessig Wolf Run likes creatures with lifelink. This card is an amazing land and I am very happy to see it printed here in FTV:20.